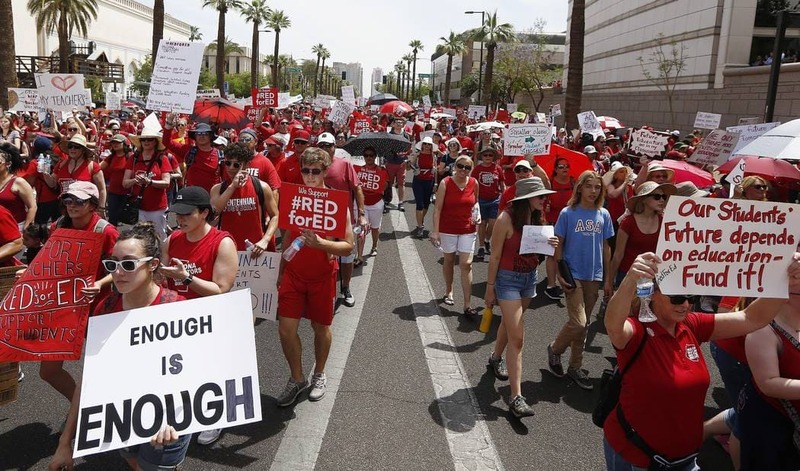 After the recent walkout by school teachers in Red for Ed movement, the House Bill 2017 proposes to end teachers’ strikes and walkouts in Arizona. The last year’s strike by the teachers shut down schools across the state for days. The shutdown ended with the promises by the State of a 20 percent pay raise and more support for education. The same has been again confirmed by Governor Doug Ducey in his State of the State address. As per Ducey, the State needs more to be done on K-12 education like focus on results, resources, and reforms. But, recently Representative Kelly Townsend from Mesa has offered her reform to be implemented for the State’s education. As per her proposal House Bill 2017, a fine of at least $5000 would be levied anyone who causes a school to close when it’s supposed to be open. There are eight exceptions like a plague of insects, an invasion, or other safety threats. Joe Thomas, president of the Arizona Education Association, said that the proposal is reactionary and it is meant to deal with the past. He doesn’t expect the bill to live a long life. Thomas said he does not want to move to the future and certainly doesn’t want anything to happen like this to tell the teachers to shut up and leave the things to someone who has been neglecting the whole education system. Representative Townsend was not available at the moment for comment. Representative Townsend on her intention and motive to propose the H.B. 2017 said it is illegal in Arizona to strike. And the last year’s episode of teachers walking out was manufactured by them calling in sick. Substitutes were arranged for a day, and again the teachers called in sick putting the safety of the school campus at stake. And for the absence finally, the schools were shut down. And the new proposed bill aims at closing the loophole so that no more pseudo-strike happens in future. And as far as fining individual teachers is concerned, she said she is open to amending this bill to hold the actual district accountable, rather than the teacher, to ensure the district is not off the hook. Replying to her proposal Thomas said he understands what the representative wants. And, it is common for everyone to want fully-functioning schools. But, the constitution also delegates her duty to provide the resources to have all the schools in the state functioning. Townsend has proposed three education-related bills in the past. And she hopes that these bills would help to fix the education system in Arizona. The previous H.B. 2016 forbids public school teachers from harassing parents, students or fellow employees. And H.B. 2018 allows the state’s attorney general to investigate any school board members or district employees suspected of breaking state law. The bill is yet to be presented in front of the lawmakers. We should see how the bill transits through the house, and all dimensions of the bill need to be debated.